Rhodium, White Gold, and Platinum? Rhodium is a precious metal in the platinum group. It is very white, highly reflective, extremely hard and virtually tarnish proof, and it is commonly used to plate white gold pieces to give them that shiny white or silvery appearance. It is very similar to platinum, sharing many of the same properties including its white colour. It is often used to plate white gold and even platinum to give it a reflective white surface. This form of plating is also known as rhodium flashing in the jewelry business. It is also used to plate sterling silver for its whiteness, its hardness, and its anti-tarnish properties. Rhodium itself is much more expensive than either gold or sterling silver. As with all plating, this plating too will wear out over time. All jewelers recommend that rhodium plated jewelry be re-plated within 1 to 5 years, depending on the the amount and frequency of the wear on the jewelry. 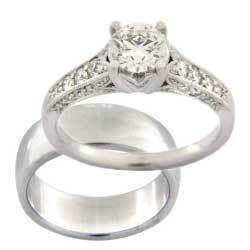 There is often some confusion between white gold and platinum jewelry. 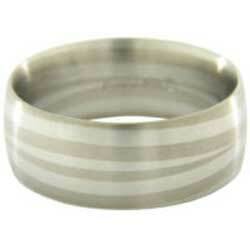 White gold jewelry, especially rings, are often electroplated with rhodium, making then more reflective and white. The colour then is just about indistinguishable from platinum. However without the plating, the difference between white gold and platinum is much more noticeable. As shown in the picture on the right, the ring, comprising of platinum (lighter bands) and white gold (darker bands) is quite different. As you can see, it makes a very interesting combination nonetheless. So why bother rhodium plating white gold just to make them look like platinum? Why not just use platinum? That is because rhodium plated jewelry is a much more affordable alternative to platinum jewelry while still giving the same reflective white silvery look. Platinum, on an average, is about 150% of the price of gold! Rhodium is very white, reflective, extremely hard and virtually tarnish proof. Similar to stainless steel in color and reflectivity, objects plated with rhodium finishes remain unusually durable, pristine in appearance, and easily maintained for many years. If you are sensitive to nickel and its alloys, a rhodium plate will eliminate this annoyance. Rhodium will maintain a bright metallic white color under all atmospheric conditions at ordinary temperatures.